People collect wooden crates by salvaging them or by buying them for next-to-nothing at a craft store. Either way, there are numerous ways you can transform these crates beyond their intended use. You might have a farmhouse aesthetic and want to use crates as a means of storage, or maybe you love modern or European styles and want to incorporate unfinished, new crates into your home design. Wooden crates can even take on a very industrial feel. No matter your design taste, there's sure to be an idea that will inspire a bright new home addition. Making a rolling cart out of wooden crates is as easy as adjoining two crates then adding casters. The way to have your crate cart stand apart is by how you style it. This workstation serves to hold a printer and some books, so it is highly functional. It is kept unfinished and styled with minimal gold accessories and gold casters for a very chic and modern look. This DIY project may not be for the novice crafter, but it certainly makes for an incredible looking storage locker! The look of this unit is very farmhouse inspired. If you want to take some elements from this locker without fully completing it, consider mixing darker wood, white paint and outlined lettering to keep your crate project looking like something out of HGTV's Fixer Upper. There are so many ways to make an end table from a wooden crate, but this is one of our favorite designs. The pipe detail along the top makes the piece look custom and not like something a weekend warrior just threw together. This shouldn't surprise you, but a lot of people use wooden crates as shelves. This particular shelving idea helps to add storage space in a small bathroom. Just be sure that the wooden crates are anchored to the wall in any shelving project, so they don't come toppling over. This outdoor bar goes to show just how versatile wooden crates can be. You might have to drive away from the craft store with a car completely filled to the brim with crates, but it will be worth it! This is by far the best example of an entryway transformation using crates. Adding stenciling to the back of the crates on the wall, and painting the interior of the floor crates adds necessary interest. Don't feel the need to be too serious when creating crate projects designed for your children's use. A little whimsy can go a long way! You may have seen this crate coffee table before, but it is a tried-and-true DIY for any traditional home. Though the basic table design might be the same, the way you finish the crate says a lot about your design style. You can stain the table like you see here, paint multiple colors or stick with the unfinished look for a Scandinavian feel. Remember when we said a little whimsy can go a long way? That's exactly how this DIY goes from boring to fantastical. Match contact paper and paint to your child's room. Hang the crates low for toy storage or hang them high to house more delicate decor items. A solo crate can be a great design tool when setting up a seasonal vignette for your front porch. Use the crate to add necessary height and interest to rustic style decor, as you see here on this spring porch tour. There are a variety of vintage wooden crates and boxes that were used for many different things. Find a smaller, more narrow wooden crate to use as a centerpiece on your dining table. Add items like mason jars in sets of three or use the entire box as a planter for succulents. Wooden crates make great organization tools, especially if the sides are completely encased in wood. Stain the boxes a rustic color and add chalkboard labels to add style to a space that otherwise would have had none. Open shelving is all the rage as far as kitchen trends go, but this idea takes open shelving one step further. Wooden crates are scattered above lower kitchen cabinets and filled with various white and two-tone dishware. This idea has farmhouse written all over it. This inexpensive solution for a TV stand can be customized to fit any size TV and even gives you space to add some additional accessories. The mason jar succulent planters and unstained crates give off a modern farmhouse vibe. 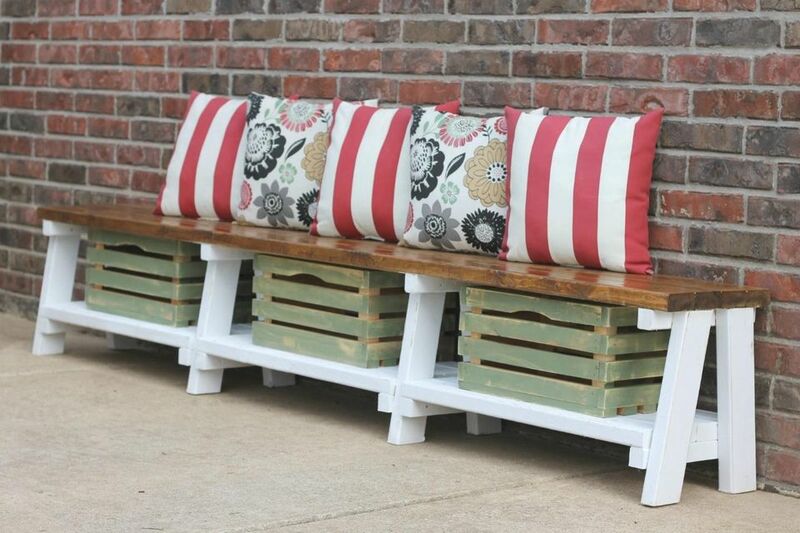 This DIY works as both a footstool and a storage ottoman. Since crates aren't that tall, it would be tough for some people to sit comfortably that low to the ground. Crates are an ideal size for a footstool! Make sure you add hinges so you can have easy access to the storage space underneath. These crates can actually be customized and then bought just like you see them here. However, it is easy enough to customize your own at home. Keeping one crate per family member on the stairs provides you with space to return school papers and other belongings to their rightful owners. The crates add enough style so that it doesn't just look like piles of clutter. This display was actually found in a very hip boutique shop, but the concept can also be incorporated into your home. When creating functional wall art, make sure things look balanced but not too symmetrical. You can even find printable guides online. There are a variety of ways you can use wooden crates to create a built-in, but this application is one of the more impressive examples. When designing a feature wall of crates, make sure not to stack crates one on top of the other. Add a slight stagger and variation but just be sure all the weight is evenly balanced. This idea is similar to the last one but on a much smaller scale and with a distinct function. Storing shoes in crates works well when you have a wide hallway or even a walk-in closet. Keep tall boots in the vertical crates and flats in the horizontal crates. How to Make a Bookshelf from C.R.A.F.T. This idea isn't so much a DIY as it is style inspiration. There are so many different ways to style a single crate. This example shows you how to perfectly place a crate on a dining room buffet. Play around with different heights inside the crate, but be sure whatever you put inside is substantial enough to stand out. This DIY is perfect for a child's room. They sell a lot of bookshelves that adhere to the wall, but we prefer these made from half-crates. Hang them low so your little one can pick out their favorite book when it's story time. This desk made from crates is more about the design than storage function given the limited space. However, building a desk using crates for one or both legs can be a great way to add more storage space to your home office. We're finishing off the list with a wooden crate that has been converted into a wine bottle holder. Stack another crate on top, then add wine glass hangers inside for added functionality.